Historically, it is slightly different than "Walk like an Egyptian." 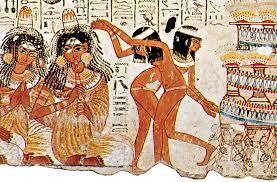 In the Egypt of the pharaohs dance was very important and essentially religious. For worship usually women danced, the shemayets. Images in temples and tombs from that time confirm this. At first this was only accompanied by clapping, later with more and more rhythm instruments. The ancient Egyptian word HBJ represents the ritual dance in honor of the sky goddess Hathor (literally: 'the eye of Horus or oudjat’). She became later goddess of love and joy, music and dance. Many dance figures have a magical significance. They have e.g. to protect the deceased from evil. Dancers hold their hands above the head, so they portray the 'Eye of Horus'. The ritual dances used a metal percussion instrument, the sistrum. Every year the festival of Bubastis takes place in honor of Bastet, the cat goddess. On the way to Bubastis the dancers stop at every village. They lay their boat and make music and dance. Some women make noise with their crotalen (small cymbals), other play on the Aulos (oboe) or sing and clap their hands. Slowly come dance apart from its religious significance. Rich increasingly luster their celebrations by dancers, accompanied by (female) musicians in linen dresses. Each king has his harem dancers, called hbjt. They are regarded lower than the musicians, all of them mention the Pharaohs 'joy cupbearers' (SHMH - jb). They dance naked, with only a lap belt of wooden beads, which pits rhythmic rattle. Their dance consists of acrobatic moves and pirouettes, graceful hand movements and swaying hips, seasoned with clapping, clappers and crotalen. An Egyptian relief shows a woman with her body making the 'bridge'. This is probably a religious dance figure associated with Nut, the goddess of the cosmos. (She is portrayed as a bridge over the earth.) HBJ not only means 'dance', but is also the name of gymnastic exercise ' the bridge ', which is still prevalent in Indian dance. The oriental -inspired Egyptian belly dance with elements of religious becomes increasingly profane, and later evolved into artistic cabaret -like (tourists) entertainment.